In most medicine cabinets across the country, you’ll find a bottle of ibuprofen (non-steroidal anti-inflammatory drugs known as NSAIDs) or paracetamol – just in case. Over-the-counter painkillers are extremely useful, managing anything from aches to a headache to a fever. It is important to follow the instructions and to visit a doctor if your symptoms do not subside. For this reason, most of us do not use these over-the-counter meds long-term, but if you do, a recent study may be of interest. This study links long-term, regular use of painkillers to an increased risk for hearing loss, specifically among women. Though the results are not concrete, it is important to pay heed – especially because hearing loss is a permanent condition. Let’s take a look at the study and its implications. Funded by the US National Institutes of Health, this study was a collaboration between the Massachusetts Eye and Ear Infirmary, Harvard Medical School, Harvard TH Chan School of Public Health, Vanderbilt University, and Brigham and Women’s Hospital. 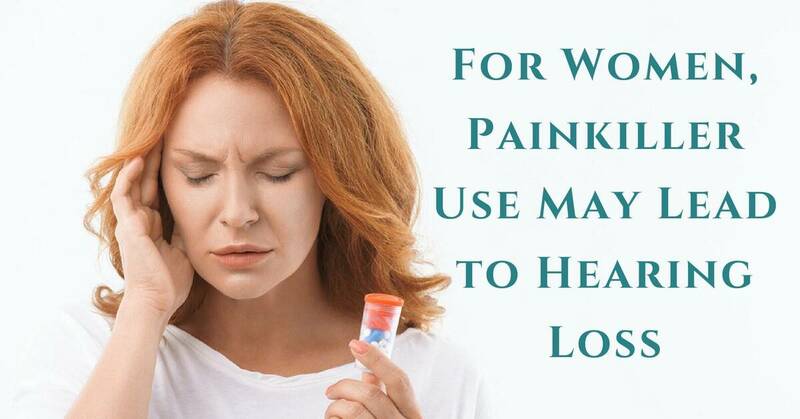 In this study, researchers defined “regular use” as taking painkillers twice a week. It used data from an ongoing survey conducted by the Nurses’ Health Study; the survey began in 1976 and included 121,700 women. Researchers for this study used data culled from 55,850 women (between the ages of 44 and 69). As a control, researchers factored in age, ethnic origin, body mass index, alcohol consumption and smoking, intake of micronutrients in diet linked to hearing, physical activity, diabetes, hypertension, and tinnitus. Women who experienced hearing loss before 1990 or women who were treated for cancer (certain chemotherapy drugs are ototoxic or damaging to the ears) were not included in this study. NSAID use (2 or more times a week) between five and six years was linked to an 8% increased risk for hearing loss. Overall, researchers believe that these various painkillers contribute to a “modest” increase in the risk of hearing loss. What’s the Link Between Painkillers and Hearing Loss? The inner ear and the tiny hairs are important parts of our auditory process, fed by healthy blood flow. Sound waves are translated into neural signals by the inner ear hair cells; these neural signals are then sent on to the brain to be received as sounds we recognize. When these cells are damaged we are at risk of permanent sensorineural hearing loss. The chemicals in these painkillers that make them effective at “killing” pain may also damage these sensitive parts of our auditory system. Though these results are not definitive, it is important to address health issues sooner rather than later. If you are consistently taking painkillers, it may be a sign to visit your primary care physician for a checkup. As for hearing loss, it usually happens gradually, over a long period of time. For this reason, we may not notice immediately if our hearing abilities are changing. Therefore, it is important to schedule an annual hearing test to monitor your abilities. Visit us at Bay Area Hearing Services to take a hearing test and consult on your hearing health.